I am not sure why this pissed me off so much, maybe the gall of this idiot. Just thought I would share this "story" with my fellow Honda riders. The part that bothers me about your story is that they are breeding. 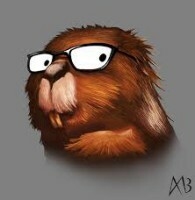 cbx4evr wrote: The part that bothers me about your story is that they are breeding. Yeah, and their attitudes breed with them. It is sad. That said, I rode Harleys for 47 years. They are loud IF you make em loud. They do not come from the factory that way. For those that can ride them, I now say, more power to them. The vibration got too bad for me. As far as power? Well that is entirely another matter. 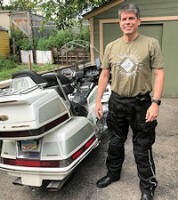 My GL1800 has far more power than my 1344 Harley did stock, but for only a little money, the Harley and the Honda are about equal but one must realize that the Harley weighed just over 600 pounds and the Honda is nearer a thousand. Gearing is another story. The Harley's gearing is like a tractor, while the Honda is like a car. I got nothing bad to say about any motorcycle. I love them all. Always did. I used to joke saying I would rather push my Harley than ride a Honda, but I rode my son's Kawi 750 Vulcan to get parts for my Harley one time, and it was a great ride. I think I would have told the guy.....At least I have a Bike to ride and I can ride farther on a tank of gas than a Harley. I could have come up with all kinds of answers for that guy, why I ride a honda. But to tell you the truth,I think I would have not said a thing.Who wants to start a conversation with that kind of a statement, and his attitude. Two week ends ago, I rode with 105 bikes and was with them from 11AM until 6PM. I was only one of 3 hondas. 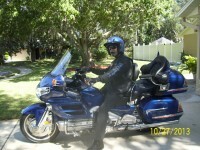 I've rode motorcycles off and on most of my life, like viking mostly harley's until I recently picked up my GL1200. I can say good and bad things about harley's and honda's, I like them both for different reasons, what matters it seems to me is that I'm in the wind on two wheels and the bike I ride is the bike I ride. As for the idiot and his statement, he's more than likely never even started a bike much less rode one he's just repeating what he heard someone else say. Think of it this way ....... he really wanted a bike, any bike, but couldn't because of his wife/girlfriend and a 3 year old sprog in tow. He was the one that was jealous or green with envy. Must have been on the east side of Omaha. This wasn't about bikes, this was some loser who saw a guy with positive things going on in his life and had to try to push his buttons to get under his skin because the world naturally revolves around the loser. FORGET HIM! Get on your Wing and head north, not south. PM me and I'll head south some sunday. We'll get togrther at Pop & Docs in Decauter for lunch. Wife and I got back into riding this year after 23 years without a bike. The thing that suprised and amazed me was that 98 out of 100 riders in rural Nebraska stick out their hand and wave as they meet. It doesn't matter what they're on. 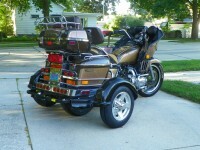 All my friends who ride (Harleys) have done nothing but admire my Wing because its a 34 year old survivor. They all say it don't matter what your ridin, as long as your out there enjoying the ride! Remember, you're the one out there living the dream and he's the pants draggin loser with no life who's wishin his face was in the wind! Randy S wrote: Must have been on the east side of Omaha. This wasn't about bikes, this was some loser who saw a guy with positive things going on in his life and had to try to push his buttons to get under his skin because the world naturally revolves around the loser. FORGET HIM! Get on your Wing and head north, not south. PM me and I'll head south some sunday. We'll get togrther at Pop & Docs in Decauter for lunch. Wife and I got back into riding this year after 23 years without a bike. The thing that suprised and amazed me was that 98 out of 100 riders in rural Nebraska stick out their hand and wave as they meet. It doesn't matter what they're on. 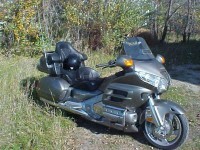 All my friends who ride (Harleys) have done nothing but admire my Wing because its a 34 year old survivor. They all say it don't matter what your ridin, as long as your out there enjoying the ride! Remember, you're the one out there living the dream and he's the pants draggin loser with no life who's wishin his face was in the wind! Yes Randy, It was on the east side of Omaha, 13th street. And I do believe he was just trying to get under my skin. Pop & Docs sounds like fun. Just a small ride north of Blair. I'll PM you soon. This reminded me of years ago. I drove with some guys and one had a hard tail Harley.We said we were going to drive over to a town 30 some miles down the road. His response was that far !! Can I drive your Honda, I said Ok, so we switched. When we got to that town, he didn't want to give my Honda back. Man , I was so glad to get my bike back. Many years ago before getting into GoldWings, I had a bike which had a kickstart and the jeans of the day were bellbottoms or flares, anyway away I went for a ride but had to fill up with petrol so pulled into the garage and put my right foot down only to realize that the kick start lever was now on the inside of my jeans and my leg did not want to touch the ground, over I went . I very soon learnt, like in the space of 2 seconds to check just where my jeans and kick start were when riding the bike ........ I hasten to add it never happened again. I'm lucky in that when bottom dwellers attempt to insult me, I feel like they are trying to amuse me. I really don't believe they think anyone could take them serious.Some drunk sitting on the curb hugging his bottle of Ripple close to his chest, or some guy pushing all his worldly goods around in a stolen shopping cart, looks at me an slurs something stupid,....... I really do find it amusing. Went to Capitol City Bike Fest in Raleigh this past W/E. 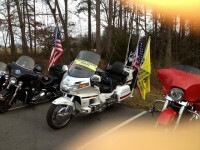 Did the Patriot Ride on Friday and then Bike Fest all W/E. It was sponsored by a HD dealer so, most of the bikes were harleys. Out of thousands of bikes, probably only 500 or so "metrics". Anyway, didn't get ANY negative comments about my Wing. In fact, with all those beautiful bikes, there were several people who took pics of MY bike. Two harley guys walked past my bike and one turned to the other, talking about my Wing, and said 'It ain't what I chose to ride but damn that's a nice bike'. What I really loved was the look of longing in most of the women's eyes when they walked by (for the bike not me) LOL. I have NEVER been made feel uncomfortable with any group when we're riding. In fact it's always been just the opposite. One new friend I made was talking to me and said 'Now I feel kinda guilty cause I have a sticker that says "I'd rather push a Harley than ride a Honda" '. I told him that was OK cause I had one that says "I ride too far, too fast, and too often to ride a Harley". We both had a great laugh about it. 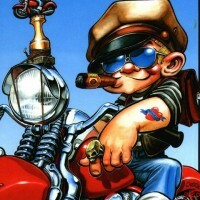 mtn_boy1 wrote: "I ride too far, too fast, and too often to ride a Harley"
That's a awesome "statement" I like it, and will use it! I always have people coming over to look at my bike, ask questions, etc...I've never had a negative comment from anyone. I think anyone who appreciates bikes, can appreciate ANY bike. I can look at a custom chopper, and while I'd never in a million years buy/ride one, I can appreciate the workmanship, the mechanics, etc. WingAdmin wrote: I always have people coming over to look at my bike, ask questions, etc...I've never had a negative comment from anyone. I think anyone who appreciates bikes, can appreciate ANY bike. I can look at a custom chopper, and while I'd never in a million years buy/ride one, I can appreciate the workmanship, the mechanics, etc. I love the ride of my '90, but. It is just a little heavy for me. I can handle it fine once moving but it is just too big. I really hate to, but am thinking of putting it up for sale. I figure early spring would be my best bet as for a good price. I haven't ridden it but once since I got a sportster. It was like going to a trail bike. 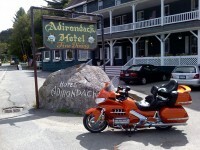 And there are many people that will argue about the distance riding on a sporty too. I don't care to ride it over a couple hundred at a sitting myself. Another thing is that the gl needs tires and that is over half a $k. I have had to pick it up a few times too. whew! And now I have a '76 shovel too so something has to go. I don't really care for cross country riding so the sportster is a blast around close. My wife won't ride with me so the wing is kind of going to waste. 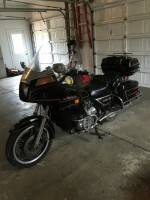 1987 Aspencade, one owner, 17000 original miles. I have been wondering, often out loud what the reason is behind the huge popularity of the HD lately. I understand the love for the cruiser style machine but the attitude that if it isn't a Harley it doesn't count baffles me. Even the argument that they are American made has faltered with Honda made suspension and off shore fasteners. I've owned two HDs (I'm a slow learner) but found the technology ancient, the ride poor, the brakes worse, and if I wanted that kind of a ride I should not be spending huge dollars for a new machine. I have an ancient Norton that does all that just as well and doesn't have to make excuses for it. I find most of the HD's I see really attractive, and I can't help admiring them when I look close, (although they are starting to look all the same to me) but there are so many superb motorcycles to choose from why do the majority think that Milwaukee Iron is the ultimate. Henry David Thoreau once said: "the ultimate symbol of decadence is the triumph of style over content" In other words, shoes that look good but hurt your feet. The Harley through no fault of it's own seems to have become such a symbol.